Knowing where mosquitoes live can be useful. Understanding the habits of these pests can also help with extermination strategies. You will discover what sort of environments mosquitoes prefer to live in. You will learn about mosquitoes’ relationships to their hosts, and where these insects go in winter. What Are the Most Common Mosquito Habitats? Do Mosquitoes Ever Live on Their Hosts? Where Do Mosquitoes Go in Colder Months? There are thousands of different species of mosquito. These winged insects can be found in regions throughout the globe. They can survive in almost any sort of climate, from temperate to tropical. Mosquitoes inhabit cities, forests, and even deserts. Antarctica is one of the few places on Earth that is inhospitable for even these hardy insects. The types of mosquito that can carry and transmit diseases to humans are relatively few. Aedes Aegypti, the yellow fever mosquito, is an agent of three major diseases affecting humans. These are yellow fever, Zika virus, and dengue. This dangerous type of mosquito is adaptable and resilient. Half of the global population live in countries that are home to Aedes Aegypti mosquitoes. Mosquitoes have different habitat preferences, depending on their stage of development. The species of mosquito also influences the conditions it needs to survive. Like many insects, mosquitoes pass through four life stages. These consist of egg, larva, pupa, and then adult stages. Depending on the species, female mosquitoes will lay their eggs in one of two environments. So-called “floodwater” mosquitoes lay their eggs during the start of the dry seasons. The eggs are laid into soil that is moist or damp. Eventually, the soil will dry out and encase the eggs. When the soils become flooded from spring rains, the eggs will then hatch into larvae. Other species of mosquito will lay their eggs in standing water. This can be in natural or artificial containers. Natural containers can be places such as tree holes or ditches. Artificial containers are man-made items. For example, plant saucers that collect water or a rainwater barrel. Almost any item that collects water is an ideal place for a mosquito to lay its eggs. Old buckets, toys, and even bottle caps are potential breeding grounds. Unlike their floodwater counterparts, these eggs must stay wet to survive. If the eggs dry out for any reason, they will not hatch into larvae. Mosquito eggs in standing water also hatch far more rapidly. Within 24 hours, larvae will be making their way out of the eggs. Regardless of species, mosquito larvae are alike. These worm-shaped creatures feed off organic refuse in their environment. If necessary, they will cannibalize each other if food sources run low. The majority of mosquito larvae are not wholly aquatic creatures. They need to surface periodically to breathe. They do so with a specialized siphon in their abdomen. It breaks through the water’s surface to access air. The larva will pass through four molts, also known as instars. The third stage is the formation of a pupa, which is a type of cocoon. Mosquito pupae are self-contained, meaning they do not need to eat. Mosquito pupae will also develop in water. After one to four days, adult mosquitoes will emerge. Adult mosquitoes are delicate beings. They are attracted to environments that are dark and humid. Adult mosquitoes’ chosen habitat depends on their host preference. A significant amount of mosquito species feed off plants. The males and females consume juices and nectar rather than blood. For example, certain tropical rainforest mosquitoes live at high altitudes. This is to better feed off certain fruits. The females of some species need blood meals in order to lay eggs. In some cases, these females will still consume plant nectars as well as blood. These bloodsucking mosquitoes prefer to live in habitats that are close to their hosts. Aedes aegypti have gradually altered habitat locations over time, becoming “domesticated”. This species actively seek out breeding sites that are close to human populations. These sites are more likely to be artificial containers—e.g., artificial ponds. Mosquitoes have specific hours during which they are more likely to be active and feed. This can vary depending on species, but most will come out to bite hosts during the evenings. When they are not feeding, mosquitoes rest. They prefer environments that are dark and humid. Mosquitoes who bite people will seek resting areas close to their meals. Common resting areas include underneath sinks or furniture. Outdoors, they will stay in thick vegetation. This is why it is important to keep your yard neat. You could be unintentionally providing prime resting spots for mosquitoes, making it harder to get rid of them from your outdoor space. Many mosquitoes will stay close to their place of birth—a maximum of two miles away. Some adventurous species, however, are capable of travelling distances of up to 20 miles. Bloodsucking mosquitoes have a wide range of potential hosts. They can target both warm and cold-blooded animals, including other insects. Unlike other pests that feed off blood, such as fleas, mosquitoes do not live on their hosts. The females use blood for a specific purpose: reproduction. Blood contains iron and protein. The females of some species need these nutrients to form and lay their eggs. The females can sense suitable hosts from a good distance. The scent of perspiration and exhalation (carbon dioxide) clue the female into the host’s location. Body heat and movement also play a role. A female can bite one host multiple times. She will bite repeatedly until she finds a vessel to extract blood from. On average, she will ingest three milligrams of blood per feeding. 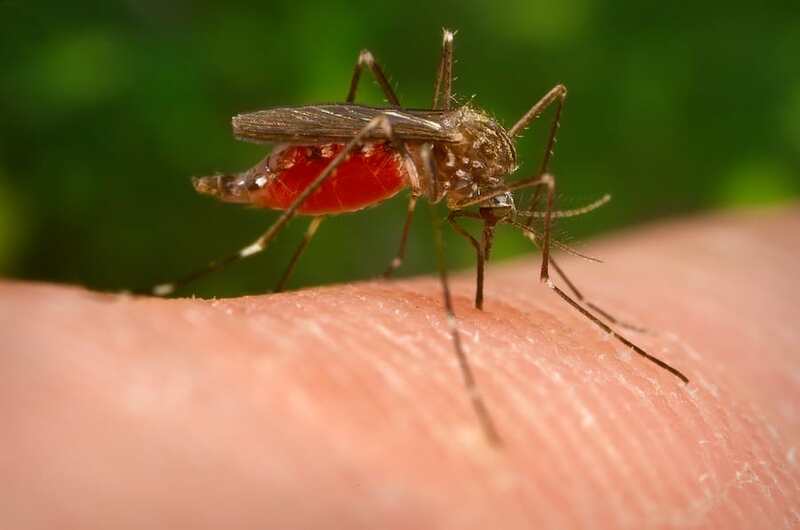 For you to develop a bite reaction, the mosquito must feed for more than six seconds. As mentioned earlier, when they are not eating, mosquitoes rest. There is a reason why summer is often referred to as “mosquito season.” These insects thrive in humidity and heat. Mosquitoes are the biggest nuisance during the summer months up until fall. Winter is when most insect populations start to decline, including mosquitoes. Unfortunately, even if the mosquitoes go away, this does not mean that they all die. Some species of mosquito will die out once the weather turns cold. However, the females can lay eggs that preserve the mosquito embryos in freezing water. These eggs will then hatch into larvae when temperatures rise. The adults that survive the winter months will enter into a hibernation state. This is known as diapause. Mosquitoes enter diapause to avoid seasons that are unfavorable to them in all sorts of climates. When mosquitoes sense a change in season, they will find shelter to prepare for diapause. Certain species get ready to lay eggs at this time too, knowing they will not live through the winter. Mosquitoes in diapause do not need food, and the females will not reproduce. This is possible because diapause slows the mosquito’s metabolism. Mosquito eggs that are able to stay viable during winter experience the same process. The larvae of certain species can also enter into diapause. The larvae remain as they are for an extended period of time before forming pupae. Mosquitoes tend to select areas to hibernate in that will shelter them from the elements. In homes, this can be areas such as basements or garages. A mosquito in diapause can live up to several months. A change in temperature will trigger the mosquito to come out of diapause. The mosquito’s metabolism will gradually restart afterwards. Eggs will hatch, and larvae will form pupae. It is clear that mosquitoes are irrepressible pests. Still, we can enjoy a respite from mosquito bites over the winter. Now that you know where mosquitoes live, you can take steps to prevent them. Apply insecticides designed to kill larvae in containers with standing water. Spray pesticides to kill adults in areas where they rest, e.g., under furniture.